Taking your cat to the vet is often very stressful for your cat!! 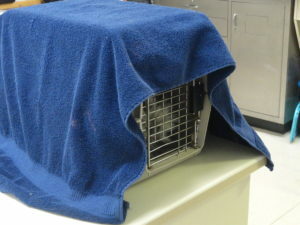 Many devoted cat owners avoid bringing their cats to the vet for this reason. Here are some tips to make this appointment as painless and stress-free as possible for both your cat and you. Try to get your cat used to being handled at home. Look in his mouth, under his tail and in his ears. Gently press on his belly and feel under and around his neck. If your cat hates his carrier (most cats do) consider getting a new one you can get a fresh start with. The carrier should be large enough for the cat to stand up and turn around in. It should also OPEN ON TOP (very important! ), so that the cat doesn’t have to be pulled out through a narrow door or dumped out, both of which are very frightening for cats. Leave the carrier out all the time, and try to get your cat used to going into it. If it’s dirty, clean it with water and a mild soap. Put soft fleece blankets in it. Add cat treats, and catnip if your cat likes it. Lure him into it with toys or with the laser pointer. Do not close the door during these sessions. Ask our receptionists when our quietest times are and make your appointment then, if possible. This will help eliminate long waits and crowded waiting rooms. Put something soft that has the scent of home in the carrier. This will hopefully be your cat’s safe place during the visit. If there is a treat your cat loves, bring it to the appointment. Even if your cat won’t eat it, it may provide some emotional comfort. 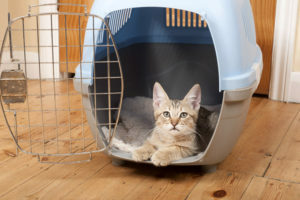 In the hospital waiting room, try to keep your cat carrier off the floor (on a bench or on your lap) and try to keep it away from dogs and other cats. We have towels in our reception area and encourage you to cover your cat carrier with one of them. When cats are frightened, they need a safe place to hide. Please speak to our receptionists if you need us to provide a quieter place for your cat. Bring some small cloth items that smell like home (clothing or a small throw, for example) These items may end up in the wash and get lost, so be prepared to part with them ultimately, but they can provide great comfort to your cat. 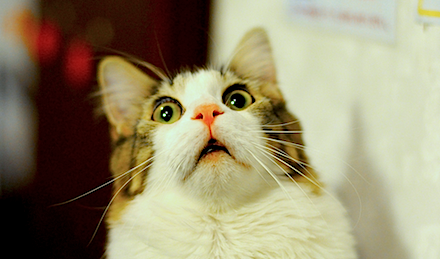 If your cat gets extremely stressed at the vet (hissing, spitting, swatting, etc.) we may be able to prescribe a gentle sedative for you to give him 90 minutes prior to leaving home, to make the visit less traumatic and more productive! Please call us to ask about this if you think it would help! !